The Cosco Scenera Next is a basic convertible car seat in the budget price range. It's one of the least expensive convertible car seats in most stores. Besides the price, though, simplicity is a big part of the beauty of the Scenera Next. There's not a lot to mess up with this car seat! Installation is relatively easy in most vehicles, and the reasonable rear-facing weight limit is fantastic for a low-priced car seat. As with any car seat, though, Scenera Next is not perfect. Convertible car seat faces rear and front. Rear-facing weight limit is 40 lbs. Forward-facing weight limit is 40 lbs. 5 harness height slots ( approx. 5.5", 7.5", 9.5", 11.5", 13.5"). Available in basic fabrics for about $50. Premium fabrics and padding available for $20-$30 more. The Cosco Scenera Next convertible car seat is simple and inexpensive. It does what it's supposed to do, and it does so for only about $50, which is an excellent price for a convertible car seat. It's also one of the lightest convertible car seats, so it's a good choice for travel. Scenera Next's simplicity is great if you need to move the car seat around a lot. Switching from rear-facing recline to forward-facing involves a quick flip of the foot. Harness strap changes are very simple, too. Slip the straps off the metal yoke on the back, feed them through the harness slots, and reattach to the yoke. The belt paths are wide and easy to get seat belts through, even when there's a large latch plate involved. The LATCh belt is attached to the car seat so it won't get lost, and it also moves through the belt guides easily. The top tether has a tilt-lock mechanism that's easy to use. Cosco put a little loop at the top of the foot so you can clip off the top tether when you're not using it, to keep it from swinging around and hitting baby. The rear-facing capacity of the Cosco Scenera car seat is enough to keep most babies rear-facing to at least the minimum recommendations. The lowest harness slot should fit most newborns well, too. While the installations are very easy in most vehicles, this seat often requires the use of a pool noodle in the rear-facing position in order to stay reclined at the proper angle. If you're moving the car seat around or traveling with it, keeping that pool noodle with the seat is inconvenient. 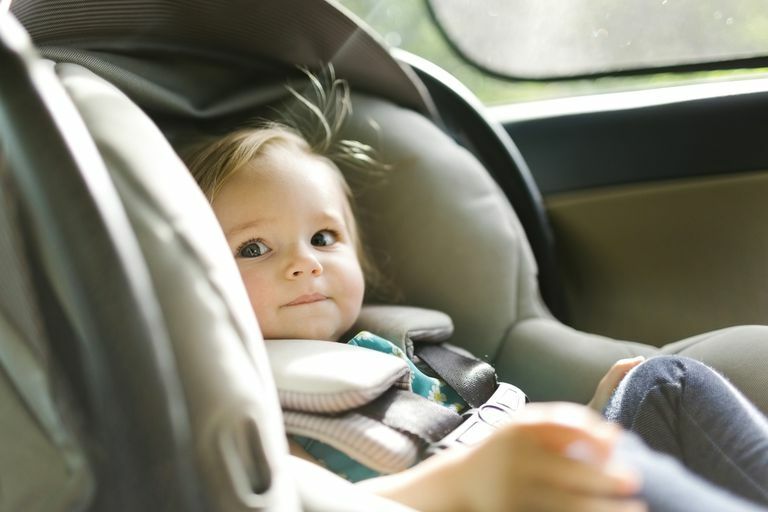 The shell height and harness height mean that most toddlers will outgrow the Scenera Next before they're ready to move on to a booster seat, so you may have to purchase a second harnessed car seat or a combination car seat to fill the gap. The harness straps may twist. Smooth them every time you use the car seat to keep them from becoming twisted ropes that don't function well. There is no EPS foam or other added impact protection in this car seat. The cover sits directly over the plastic shell. There can be sharp or rough edges on the plastic near the belt paths on the Cosco Scenera Next. Watch your hands when you're threading belts through, so you don't end up with scrapes. Should You Buy a Cosco Scenera Next? If you're in need of a convertible car seat and you have a tight budget, the Cosco Scenera Next is definitely the one to buy. Compared to others in its price range, Scenera Next comes out on top because of the rear-facing weight limit, the infant-appropriate lower harness slot height, and the ease of installation and adjustment. The Cosco Scenera is also a good choice if you need a spare seat to switch around between cars, or if you want a lightweight travel car seat that you'll be carrying through airports. Keep in mind, though, this is primarily a rear-facing car seat. By the time your child outgrows the rear-facing capacity, it probably won't be useful very long in the forward-facing position due to the shell height, harness slot height, and weight limit. If your baby is on the higher end of the height and weight growth charts, you should consider budgeting for a taller car seat with higher weight limits. However, the Cosco Scenera car seat will hold most kids comfortably and safely for a few years, at least. The cheaper Scenera may give you time to save for a larger car seat or combination car seat to use down the line. If you want a little higher weight limit on the forward-facing side, you should also consider the Cosco Apt 50. The shell is slightly wider but still lightweight, and the forward-facing weight limit is 50 pounds. The rear-facing weight limit of the Apt 50 is 40 pounds.